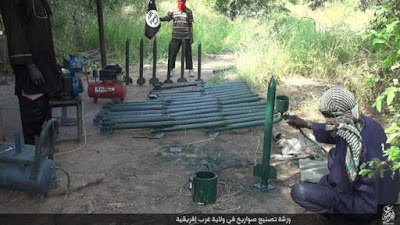 Islamist militant group Boko Haram has released photos apparently showing a rocket-making factory in north-eastern Nigeria. The group has used rocket-propelled grenades in the past and many Nigerians have been asking where the weapons have been coming from. The photos seem to indicate that members of the group have the technical know-how to manufacture weapons. The pictures are believed to have been taken in a college in Borno state. They were sent as a Whatsapp messages to the BBC Hausa service using a telephone number from Cameroon, and have also been published on sites linked to so-called Islamic State, which Boko Haram has joined. Analysts say it looks as though the machinery is from Bama, a town in north-eastern Nigeria recently recaptured from Boko Haram. An inscription on one of the machines shows the abbreviation of Government Technical College Bama (GTCB). The equipment appears to have been donated to the college by the Educational Trust Fund (ETF) in 2005. It is not clear when the pictures were taken, or whether the equipment has been moved from Bama. The army has recaptured most of the towns previously under Boko Haram control but the group still carries out frequent attacks, especially in Borno State, where Bama is located.